When it was my turn to practice, I said that I had to do quite a bit of yak shaving before I could work on my slides, and since no one was familiar with the term, I had to explain it. I basically said “It’s the work you need to do before you can do the work you need to do.” I cited one of the participants who said that before he built something, he had to build a workbench. (Obviously! Any yak shaver would agree.) 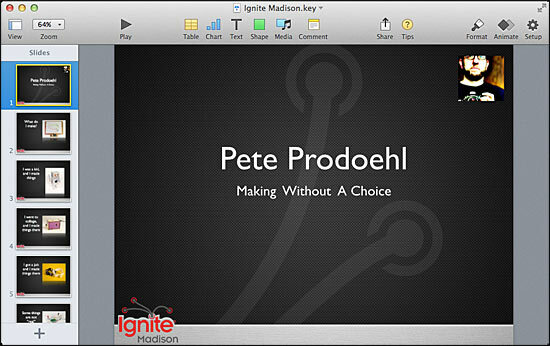 As for me, before I could get my slides started I had to find an Ignite slide template, and then I had to find an Ignite Madison logo, and scale it down, and clean it up, and drop it into the template, and once that was all done I could totally start my slides. Any apparently useless activity which, by allowing you to overcome intermediate difficulties, allows you to solve a larger problem. I was doing a bit of yak shaving this morning, and it looks like it might have paid off. A less useful activity done to consciously or unconsciously procrastinate about a larger but more useful task. I looked at a reference manual for my car just to answer one question, but I spent the whole afternoon with my nose buried in it, just yak shaving, and got no work done on the car itself. So yeah… yak shaving. There’s a few interesting citations for the term as well. And even more interesting is Joi Ito’s realization that yak shaving is pretty much his job. Damn! I guess I should add “yak shaving” to the old resume, eh? Hmmm, now where was I? Oh yes! Come hear 10 makers talk about making, and help out some kids in need. It’s a win-win-win situation! You can buy tickets to the event and all proceeds will be donated to Big Brothers, Big Sisters of Dane County.